You will marvel at this program and its fascinating exploration of scientific marvels in the world of animals. Dr. Jobe Martin provides powerful evidence that suggests how some animal designs can be attributed only to a Creator. Have you ever wondered . . . Are there really creatures that produce fire to defend themselves? How does a giraffe get a drink without causing lethal blood pressure to his brain? How can Geckos walk upside down, even on glass and not fall? 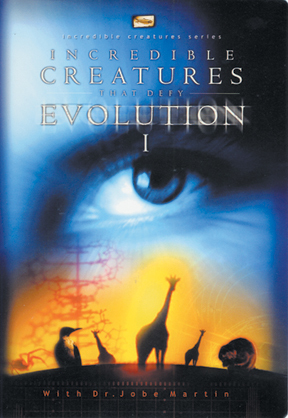 Incredible Creatures that Defy Evolution 1 presents powerful evidence that proves that animal designs can only be attributed to a creator. They cannot possibly be explained by evolution. This program will inspire you to look more closely at the world around you.